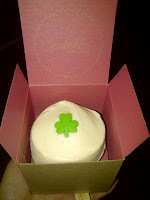 Foood is Goood: Sprinkles Cupcake ATM & Green Velvet! Sprinkles Cupcake ATM & Green Velvet! Yesterday I had a job interview in the Santa Monica area so I decided to stop by the Beverly Hills Sprinkles. After seeing many posts online about the 24 hour "Cupcake ATM," I thought why not go see it for myself? 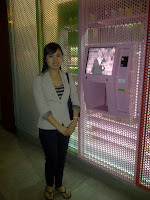 The ATM has just opened last Friday March 2. At the time of my visit it was day 5 of business. 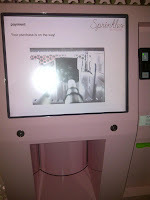 The Cupcake ATM is basically a vending machine for Sprinkles cupcakes and other Sprinkles products. I guess if you live around the area and are desperately craving a gourmet cupcake, the 24 hour machine will satisfy your uncanny cupcake addiction. Though entirely automatic, the ATM still has a Sprinkles staff member in front to make sure things run smoothly. I guess it's also for impatient customers like me who need someone to guide them through the new machine. 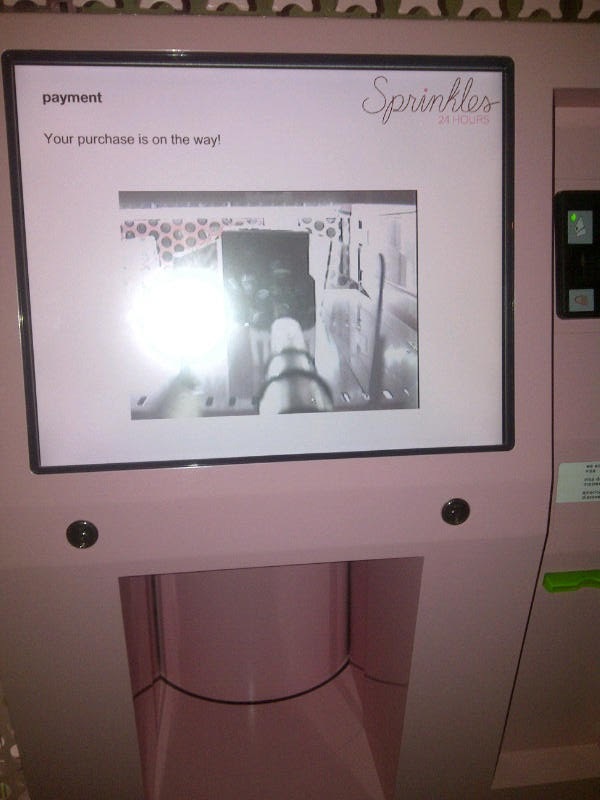 Sprinkles still promises freshly baked cupcakes even through the 24 hr machine, what a relief. Honestly the ATM machine line was going faster than the in-store one, so hopefully those infamously long lines in front of Sprinkles will diminish. A couple minor things to note about ordering from the ATM is that you can only order one cupcake at a time, they charge you $4.00 (instead of the regular $3.50/cupcake), and they give you the specialty box for each individual cupcake. Of course you're probably asking, what did I order? (Even if you don't care, well too bad!) I chose the special flavor of the month: St. Patrick's Day Irish Chocolate cupcake (available March 2-18). You can virtually watch the dispensing process! By the way, on St. Patrick's Day (March 17) Sprinkles will be offering the "Green Velvet" for one day only. The classic Red Velvet will transform to the notorious green shade! Check out www.sprinkles.com or follow @sprinklesbh for updates. SUSHI + PIZZA = SUSHI PIZZA!